I am a Sivananda Yoga Archaya, Master of Yoga and did my 500hrs Teacher-Trainings in India: 200hrs in Vrindavan 2011 and 300hrs in Uttarkashi 2016. My classes are based on the Hatha Yoga tradition with additional influences from my travels and workshops. The basic classes contain breathing, relaxation, sun salutation and Asanas, the yoga postures. I give private and group classes in Malaga as well as teaching in workshops & retreats all over andalucia. Additional I offer mantra-singing workshops and Kirtan. I believe the yoga pactise is for every Body and I teach small groups at my place with a maximun of 10 people. This way I can take care of every single person. 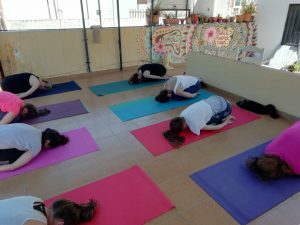 The yoga classes are open for all levels and given in english, Sundays on the rooftop terrace of my house and during the summer usually Wednesdays at the beach of el Palo/ Malaga. You will feel the difference breathing the fresh air of the costa del sol. The timings for the beach yoga classes vary over the year as the final relaxation comes hand in hand with the sunset. For Dates, Timings & Places have a look on the Yoga Class Calender. From Malaga center it will be around 20min. by bus. You can take the number 3 or 11 to el palo. Leave at the bus stop Calle Almeria/Padre Coloma and go down the Calle Padre de Coloma in the direction of the beach. For the Beach-Yoga and Beach-Kirtan we meet on the water-breaks in front of the house-number 55 of the street: Calle Banda del Mar. The meeting-point is marked with a star on the google maps. For the terrace yoga classes take the second street on the right side, Calle Practicante Fernandez Alcolea 19, is mine and the house on the right side of the street. For the Beach-Yoga and Beach-Kirtan meet on the water-breaks in front of the house-number 55 of the street Calle Banda del Mar. The house is a google maps point. Or you can come by bike taking the sea front boulevard, this will take approx. 40min. By car you need to be lucky to find a parking place on the street.